Our director of marketing sounds on on her favorite places to eat. 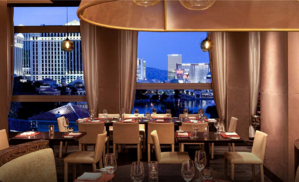 Nobu – My absolute favorite place to eat in Vegas. Asian cuisine is my favorite and their quality and service is top-notch. Top of the World (pictured right) – Second favorite place to eat. 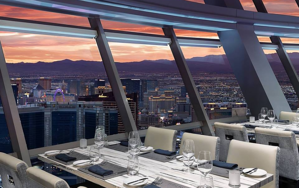 Best views in Vegas, quiet and relaxing and their food is quite good. In-N-Out Burger – Miss this place so much since moving from SoCal. Off Campus – My favorite thing to do away from the show floor is to go dancing or see a Cirque du Soleil show. Our Director of Sales, Eastern USA, says "of course there are a million high-end restaurants and places to drink. Some are spectacular but they are also pricey. I tend to like to live like a bit of a local." Golden Steer Steakhouse – A classic old Ratpack joint with Velvet Wallpaper and booths that Frank and Dean sat in. Good food and close to Strat, where Telos Alliance calls home during the show. The PepperMill – Classic Vegas-style Denny’s. Big food. Always open. Great late night. In-N-Out Burger – East Coast guy here, so getting this treat is only once a year…and a good burger is a good burger. 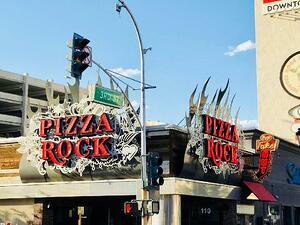 Pizza Rock (pictured right) – Cool Pizza Place in Old Downtown Vegas. Lindo Michoacán – Local Mexican restaurant that is cheap, legit, and makes table-side guacamole. Off Campus – Don’t get much time to do fun stuff away from the show. 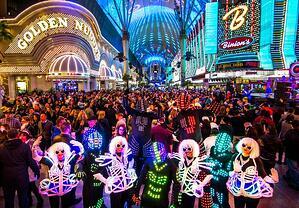 But usually get to Freemont Street every year. Maybe get to go to a show, if I am lucky. Good Shows can be anywhere. I saw “Absinthe” a couple years ago and never laughed so hard. It was outside of Caesars in a tent. Unassuming shows in random locations are usually something not to overlook. Our VP of Business Development - TV, says "One of the problems with Vegas is that as soon as you get to like somewhere, it gets shut down and replaced with something else, but here goes..."
Firefly Tapas Kitchen and Bar – Off-strip place with outdoor seating, good food and excellent margaritas. It is sensibly priced and has a nice vibe too it. Plus, you get small plate orders to share and can order more if you need it at any time. Hofbräuhaus – It’s just like the one in Cleveland, except it’s in Vegas! Entrees are enormous and so are the beers. Unlike Cleveland, they will spank you with a wooden paddle if you ask nicely (I have video). Greg Shay will be there one night, and so will I! We usually get a crowd together one night during the show. 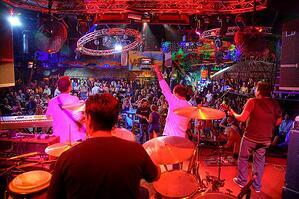 Cabo Wabo Cantina (pictured right) – Sammy Hagar’s place on the strip outside Planet Hollywood Hotel. It’s basic stuff but has great outdoor seating to watch the crazies go by. Music is good if you like to rock! Mon Ami Gabi – Great French place inside Paris Hotel if you’ve got important customers. Not super expensive but not cheap either. Yard House – Beer and eats just off the strip near the Flamingo and Harrah’s. It’s good value for Las Vegas with a large selection of drinks and food. Joe's Seafood, Prime Steak & Stone Crab – Another one to take customers or to suggest if someone else is paying! It’s in the Caesars Palace Forum Shops right at the end near the exit by the Mirage. The Capital Grille – On the outside of Fashion Show Mall, this is another place where you take clients or get someone else to pay! Great place with private dining rooms if you need a place to talk business. Peppermill Fireside Lounge – An institution in Las Vegas. One of the old Vegas eating places with decent food, but you go for the atmosphere not the cuisine. Frankie’s Tiki Room – It’s off the strip in a slightly seedy neighborhood. There is no natural light, no clock , it’s open 24/7/365 has a zillion rum cocktails and doesn’t serve food! What’s not to love? Fremont Street (pictured right) – Old Las Vegas, the place where every band goes to shoot their cool music videos, and everything is cheaper and a little sleazy. If you see nothing else of Vegas beyond the NAB and the Hotel, see Fremont Street. It’s where old Las Vegas is still alive and kicking. Off Campus – If through some fluke of luck, you get any time off during the trip or you are staying an extra day (or flying late Friday), check out The Mob Museum. This place is great. Book ahead and sign up for the Crime Lab and Firearms Training Exhibits. Senior Director of Enterprise Sales, the Americas, says "If you’re a “foodie” and/or like watching the Food Network shows, these places are musts!" Jaleo in Cosmo Hotel – Spanish tapas-style restaurant from José Andres, of which he’s got about five of them in the USA. Probably the single closest thing to eating in Spain you’ll find in a major restaurant anywhere outside of Madrid! And my wife and I did a guided “tapas crawl” in Madrid a few years back, so I have a half an idea what I’m talking about here! Scarpetta in Cosmo Hotel (pictured right) – If you’ve ever watched “Chopped,” Scott Conant is one of the regular judges and he’s kind of the “Pasta Nazi” on the show! If you’re gonna serve pasta on that show, you damn well better make sure you cook it properly! And I will say, Scarpetta does pasta pretty much perfectly! Mesa Grill in Caesar’s Palace – Bobby Flay, another Food Network celeb, has this great southwest place in Caesar’s. Pricey, but worth every penny! For Jayson Tomlin, Mr. "There's Only One Place to Go"
That pretty much says it all from our Strategic Marketing Director. 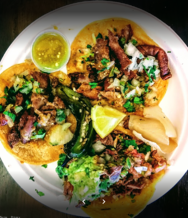 Taco y Taco (pictured right) – Best Al Pastor tacos in Vegas!